One of my favorite parts of Summer is the berries! And, luckily the wild raspberries are growing like crazy around here this year! Every time Eric and I go out for a walk practically we find more ripe ones to pick. I guess I consider berries special because it is only this time of the year that they taste the best, and are affordable to buy. I always try to buy organic berries if I am buying them because they are a heavily sprayed crop, and in the off months (so October through end of April), I see raspberries being sold for $8.99/lb sometimes! Yikes, and they don't even taste that good because they have to be shipped in from far away. This is why it is important to eat in season fruits and enjoy them while you can! So between the wild raspberries I have picked, and the good prices on berries lately I have been eating a lot of them. Why not? They are high in vitamins and antioxidants! I had 3 different kinds of berries in my fridge, and I said to myself, I need to make something pretty and delicious with some of these. Involving chocolate. 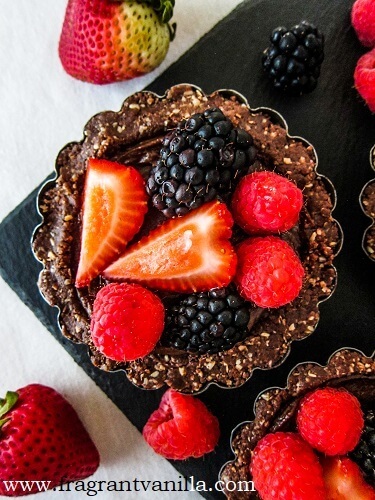 Because chocolate is absolutely amazing with berries! I did not want to spend a lot of time on it though because it was a work night, so I decided on some simple chocolate tarts. I had all of the ingredients on hand (mostly pantry items except the berries), and they took me about 30 minutes to make. For the crust I used a mixture of oats, nuts, and cacao powder. Super easy, and all you do is press it into the pans, no baking required, which is always good on a 90F degree day, which it was! 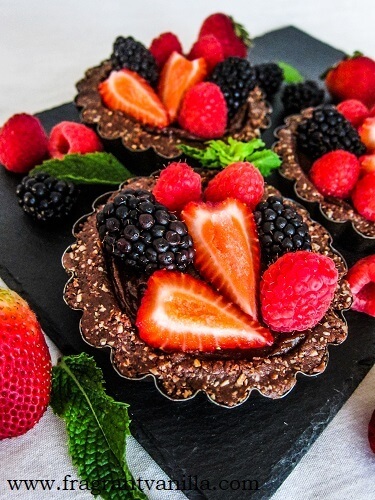 I made a luscious avocado mousse filling so good I could have eaten it with a spoon, but I saved it for the tarts. 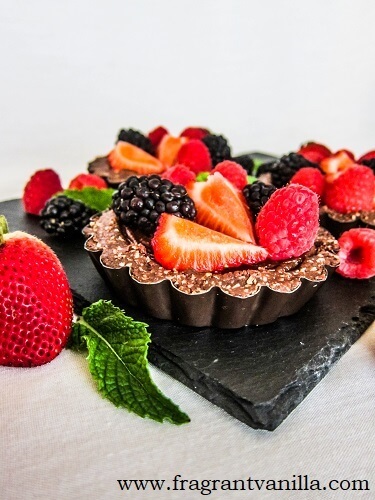 They would have been good just like that of course if all you wanted was chocolate, but berries were to be the star of this show, so that is what I topped them off with. They were so pretty! Almost too pretty to eat, but that never stops me when I am hungry. They were so good with the creamy rich chocolate filling, crunchy crust, and sweet jammy berries! These are actually pretty healthy, so I wouldn't judge if you decided to eat all three that the recipe makes instead of sharing them! To make the crusts, combine all ingredients in a food processor and process until the mixture is the consistency of dough, and holds together when squeezed. Oil 3 4 inch tart pans, and press the mixture into the bottoms of the pans and up the sides. To make the filling, place all ingredients in a food processor and process until smooth. Spoon into the tart shells, and smooth the tops. 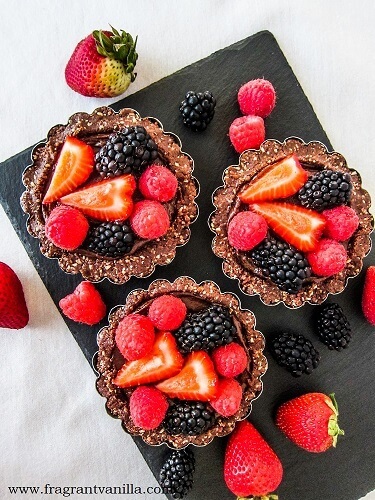 Arrange berries on top of the tarts, and refrigerate for at least 3 hours before serving.